Alex has planned and executed her life with laser focus since she first met her future husband at the play-doh table on the first day of kindergarten. They have a terrific life, a gorgeous house on the bay, and fantastic careers they love. There’s only one problem: Alex’s husband Michael is gay, a fact he neglected to mention in the 23 years since they first met. Now, Alex’s perfectly planned life has completely fallen apart, her biological clock is starting to feel like the timer on a nuclear device, and she finds herself drooling over her completely-dreamy-but-definitely-off-limits client, a star chef opening a hot new restaurant. 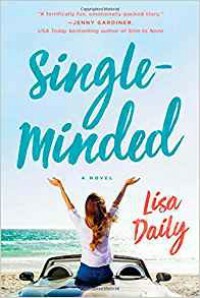 Armed with dating guidance from her oddball collection of advisers—including her gay ex-husband, a foul-mouthed political consultant, a perkily masochistic yogi, and a pot-smoking octogenarian—Alex navigates the booby-trapped world of modern dating, in her search for a second chance at love. Daily is a splendid writer and my heart was in my throat through many of the scenes of this book. I think at heart this book stood out to me as a romance, though it did also address issues of self-worth and how one can view and value themselves as the world around them changes. I can relate to Alex in how driven she is and in how she plans for things to go in a certain way so that she can meet success. I definitely would have liked to have seen more about her business--the scenes were she had events that could make or break it were really interesting and I was fascinated by her job as an environmental psychologist and wanted to learn more. I loved seeing her entering the world of dating. I generally enjoy this, but it was especially great as she was a very put together character who just simply had never really been on a date in her life and because of that, there were many pitfalls that she had to work with throughout. Her first "Tinder"-esque dates especially were intriguing, and I was curious about her friend's idea of needing to date a certain number of people of certain types before being able to marry. The "fish" especially resonated with me--that most people will have one person that is perfect in many ways, but there's something that just makes the relationship incompatible. I felt like several scenes were sped through and could have used more detail to build up suspense and to really put me in the scene. I also wish there had been more resolution about a certain intriguing portrait. This is a lovely women's fiction novel that I found to have quite a satisfying romance. I recommend it as a light read.